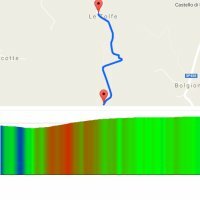 Saturday, 3 March 2018 - The women's Strade Bianche, or Strade Bianche Donne, amounts to 136 kilometres with almost a quarter on gravel roads. The riders hit eight 'sterrati' with a total distance of 31.4 kilometres. The finish lies at the end of a sharp climb to the Piazza del Campo in Siena. Elisa Longo Borghini is title holder. In a thriller of a finale she held off Kasia Niewiadoma and Lizzie Deignan in last year’s race. Starting from the Medici Fortress of Siena the women hit the first gravel sector at kilometre 17.6. It’s 2.1 kilometres and perfectly straight. The day’s first climb coincides with the second sector, 5.8 kilometres in length and with steepest ramps up to 10%. Then two sectors with no significant gradients – respectively 4.4 and 5.5 kilometres – run to Buonconvento, where a relatively easy stretch sets in: some 13 kilometres on flat tarmac. The next gravel sector is halfway through the 2018 Strade Bianche for women. At 9.5 kilometres it’s the longest sector of the race. Continuous up and downs in the first part make way for a twisting climb before meeting the tarmac again. Now we enter the quiet for the storm – at least, in theory. The next 34 kilometres are played out on paved roads – the first half on descent and on the flat, the second half on undulating tarmac – before a 800 metres gravel sector coincides with a double digit gradient ramp. Almost without delay the women hit the penultimate gravel road. Sector 7 is 2.4 kilometres and climbs up the Strade di Colle Pinzuto with gradients of up to 15%. The hardest ramps appear early on, although the dust sector continues to climb gradually until the end. The last gravel sector is only 1.1 kilometre. It opens with a demanding descent and then a very punchy climb, with a steepest stretch at 18%, leads to Le Tolfe. When hitting the tarmac again there are 12 kilometres left to race. Twisting and undulating roads run to a descent with 5 kilometres out. The route joins Via Esterna di Fontebranda and shortly the gradient touches 9%. Then the riders pass beneath the Fontebranda Gate. Only 900 metres to go now and the road continues on paving slabs. The gradient exceeds 10% until 500 metres from the finish line the steepest sector hits 16%. A sharp right hand turn with 300 metres to go, while the climb flattens out. In the last 70 metres the route of the Strade Bianche enters the Piazza del Campo and the final 30 metres are downhill. Lizzie Deignan has the best track record at the Strade Bianche. In all three editions she ended on the podium (second in 2015, winner in 2016, third in 2017), while Elisa Longo Borghini comes close with a third place (2015), fourth place (2016) and victory (2017). Kasia Niewiadoma finished in second on last two editions, while Megan Guarnier won the women’s Strade Bianche in 2015. Read also: results/race report 2018 Strade Bianche Donne.